HARRISBURG, Pa., March 14, 2019 /PRNewswire/ — TE Connectivity (TE), a world leader in connectivity and sensors, has introduced a sliding power connector. This is one of the only connectors of its kind that allows for hot swapping (serviceability) of components in a server drawer without shutting power down to the entire system. Designed for applications such as hard disk drives, power supply units, racks, servers, storage units and other high-current applications, the sliding power connector saves significant operational costs because it can reduce the need for system downtime that is normally required when swapping server drawer components. The sliding power connector can also minimize the need for a bulky cable management system within the drawer, opening up more space for airflow and reducing overall cooling costs. It also shows improved voltage drop over cables due to a more direct path from the power source to the server, increasing energy efficiency. 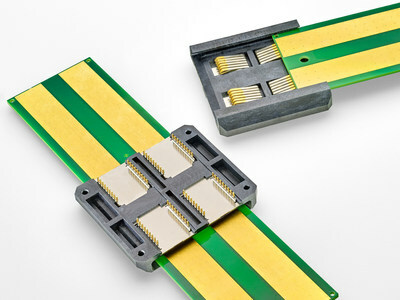 With limited cabled connections, the sliding power connector is also more reliable and leverages a simpler design that is less prone to disconnection from the power source. TE Connectivity, TE, TE connectivity logo, and EVERY CONNECTION COUNTS are trademarks owned or licensed by the TE Connectivity Ltd. family of companies.Other logos, product(s) and/or company names might be trademarks of their respective owners.